While you can use regular salad cucumbers, I usually make it with smaller pickling cukes. They’re seasonal and too cute to pass up. A batch is 4-6 small pickling cucumbers or 1 large one. Wash the cukes and trim of both ends. Cut them into 1/2" slices. If you use full-sized cucumbers, scoop out the seeds too. 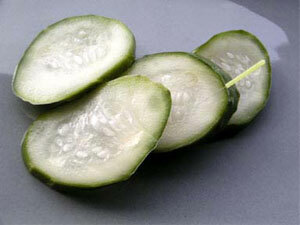 Sprinkle 2 tsps of salt on the sliced cucumbers and let them sit for 5-10 minutes. Then rinse them off in cold water. This draws water out of them but be sure to rinse them well so they aren’t overly salty. Mix 4 Tbsp rice vinegar, 2 Tbsp sugar, and 1/4 tspn of salt. You can add 1-2 cloves of sliced garlic, a bit of red pepper, and/or a piece of lemon zest. Add the rinsed cucumber slices and put them in a non-reactive container (glass or plastic). Store in the refrigerator overnight, shaking every time you open the door to grab a beer. In a pinch, you can make these in the morning and they’ll be ready by dinnertime. They’ll keep in the refrigerator for a couple of weeks. This is a basic recipe so feel free to modify it to your own tastes. Truth be told I use this same recipe for other vegetables like garlic, sea beans (Salicornia), carrots, etc. Here’s another resource on homemade refrigerator pickles. They’ both easy to make and quick to prepare. Mix up the vegetables. Whatever’s fresh!